And now, a blown-up detail from a comic book that’s coming out this week. That first one is Space something-or-other, which I thought was Force at first until, duh, I noticed there’s a rocket ship on the cover. 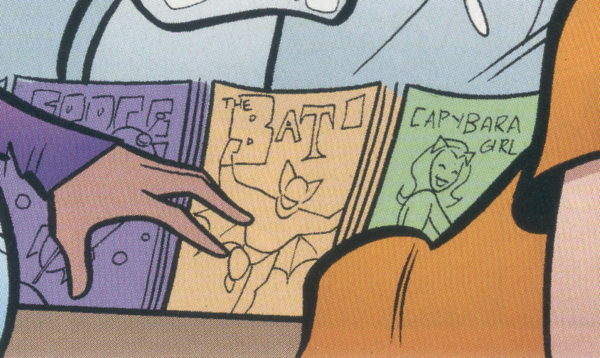 That second one is The Bat , which can only be a parody of Spider-Man, I’m sure you’ll all agree. But that third one…that’s Capybara Girl , while being a clear take-off on Squirrel Girl , is totally a comic book I would read, given my life-ling appreciation of the world’s largest rodent. I’ve written about Die Kitty Die before…Archie Comics artist Parent mixes a little satire of the comics industry with some very mild cheesecake and the occasional rude gag (like this issue’s pottymouthed Mrs. Claus) and a whole lot of silliness, all wrapped around the not-dead-yet title character, Kitty…who is also a witch, by the way. It’s cute and fun and despite appearances, not for kids…and it’s put the idea of “Capybara Girl” out into the wild, so it’s okay by me. So, you’re okay with the titles being out of alphabetical order on the shelves? I would have thought for comic shop employees that’s like a hidden stressor. “Apace” as in fast, or quickly? With a rocket ship on the cover? You know, I would totally pick that book up!